The Model B is a full featured, single channel, dual output vehicle detector that incorporates the reliable vehicle detection technology found in all of Reno A & E s vehicle detectors. All detector functions and settings are configured by using a set of eight internal DIP switches and a front panel mounted pushbutton switch. Fail-Safe or Fail-Secure versions available. Delay Outputs A and B for two seconds. Sensitivity Boost for applications where high-bed vehicles might be encountered. Detect Memory feature maintains detection during momentary power interruptions of up to two seconds. Fail LED indicates current loop failures or loop failures that have occurred. Loop Fail Memory stores a record of the last loop failure. This is a Performance Specification. It is not intended to be used as Operating Instructions. Loop Frequency: Four (4) operating frequencies (normally in the range of 20 to 100 kilohertz) are selectable by means of a front panel mounted pushbutton switch. Sensitivity: Eight (8) detection sensitivity levels are selectable by means of three internal DIP switches. Vehicle detection results from a sufficient negative change in loop inductance. Sensitivity Boost: An internal DIP switch may be turned on to increase sensitivity during the Detect State. When a vehicle enters the loop detection zone, the detector sensitivity is automatically boosted to a higher level than the vacant loop setting. The boosted sensitivity level is maintained throughout the Detect State. When the vehicle leaves the loop detection zone, the sensitivity immediately returns to the vacant loop setting. Output A Presence Modes: Output A has two presence hold times that are selectable by means of an internal DIP switch; True Presence and Limited Presence. 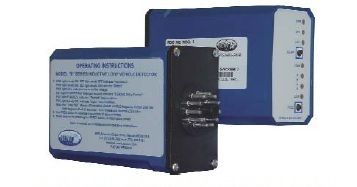 Both modes provide a Detect output when a vehicle is present in the loop detection zone. Limited Presence will typically hold Output A in the Detect state for one to three hours. True Presence will hold Output A in the Detect state as long as the vehicle is present in the loop detection zone and power is not removed or reset applied. Output B Modes of Operation: Output B has three modes of operation that are selected by two internal DIP switches; Presence, Pulse-on-Entry, or Pulse-on-Exit. When operating in Presence mode, the presence hold time is the same as Output A. When set to operate in Pulse mode, the 250 millisecond pulse can be set to occur when the vehicle enters the loop detection zone (Pulse-on-Entry) or when the vehicle leaves the loop detection zone (Pulseon-Exit). Fail-Safe / Fail-Secure Operation: The detector is factory configured for Fail-Safe or FailSecure operation. When the detector is configured to operate in Fail-Safe mode, Output A will assume the Detect output state (Relay A Normally Open contacts closed, Relay A Normally Closed contacts open) during a power loss or loop fault condition. When the detector is configured to operate in Fail-Secure mode, Output A will not respond to power losses or loop failures (Relay A Normally Open contacts open, Relay A Normally Closed contacts closed). Call Delay: A two second delay of Outputs A and B can be activated by setting an internal DIP switch. Output delay is the time the detector outputs are delayed after a vehicle first enters the loop detection zone. If the Delay feature is activated, the outputs will only be turned on after the two second delay time has passed with a vehicle continuously present in the loop detection zone. Power Indicator: The green Power LED is Off when the detector has no power supplied or when the power level is below 75% of its nominal value. The Power LED is On when the detector is being supplied with a suitable level of power. Detect Indicator: The red Detect LED is Off when the loop detection zone is vacant. The Detect LED is On when a vehicle is being detected. The Detect LED flashing at a four Hz rate with a 50% duty cycle indicates that the delay interval is currently timing. Fail Indicator: The red Fail LED indicates whether or not the loop is currently within tolerance. If the loop is within tolerance, the Fail LED will be Off. If out of tolerance, the LED indicates a current loop failure by turning On (Open Loop) or flashing at a one Hz rate with a 50% duty cycle (Shorted Loop). If and when the loop returns to an in tolerance state, the FAIL LED will turn Off or stop flashing and the detector will resume normal operation. Non-Volatile Loop Fail Memory: If a loop failure occurs and the loop returns to an in tolerance state, the detector will store information pertaining to the type of loop failure in nonvolatile memory. To review the type of loop failure (if any) that has last occurred, press and hold the Frequency pushbutton for at least three seconds. Detector Reset: The front panel mounted Reset pushbutton is used to reset the detector. Changing the position of any internal DIP Switch will also reset the detector. After changing the Frequency setting, the detector must be reset. Detect Memory: The Detect State of the detector is maintained during momentary power interruptions of up to two seconds. Self Tuning: The detector automatically tunes and is operational within two seconds after application of power or after being reset. Full sensitivity and hold time requires 30 seconds of operation. Environmental & Tracking: The detector is fully self-compensating for environmental changes and loop drift over the full temperature range and the entire loop inductance range. Loop Inductance Range: 20 to 2000 microhenries with a Q factor of 5 or greater. Loop Feeder Length: Up to 2500 feet (762 m) maximum with proper feeder cable and appropriate loops. Loop Input: Transformer isolated. The minimum capacitance added by the detector is 0.01 microfarad. Grounded Loop Operation: The loop isolation transformer allows operation with poor quality loops (which may include one short to ground at a single point). Lightning Protection: The detector can tolerate, without damage, a 10 microfarad capacitor charged to 1,000 volts being discharged directly into the loop input terminals. Electrical Isolation: The loop is isolated by means of the loop isolation transformer. The outputs are isolated by means of the output relays. Relay Outputs: Rated for maximum continuous current of 6.0 amps, 300 VAC maximum, 150 VDC maximum, and 180 Watts maximum switched power. Power: 120 VAC versions (B-3 or B-1): 89 to 135 VAC, 4 Watts maximum. 240 VAC versions (B-8 or B-35): 180 to 270 VAC, 4 Watts maximum. 12 VDC / 24 VDC / 24 VAC versions (B-4 or B-5): 10 to 16 VDC, 80 milliamps maximum / 20 to 34 VDC, 50 milliamps maximum / 18 to 32 VAC, 4 Watts maximum. Ruggedized Construction: 11-pin (Amphenol style connector) detector enclosures are made from a high temperature rated plastic. 10-pin (MS style connector) detector enclosures are aluminum with a durable powder coated finish. Printed circuit boards are 0.062 inch thick FR4 material with 2 oz. Size: 11-Pin Models - 3.00 inches (7.62 cm) high x 1.75 inches (4.45 cm) wide x 4.30 inches (10.92 cm) deep (excluding connector). 10-Pin Models - 2.90 inches (7.37 cm) high x 1.60 inches (4.06 cm) wide x 4.96 inches (9.24 cm) deep (excluding connector). Quick, accurate delivery. Direct replacement - works great. Replaced an identical detector that had received significant water damage over what appears to be more than 20 years of service. Exact replacement and works just fine.